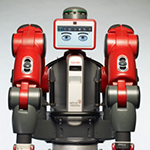 Baxter is an industrial robot built by Rethink Robotics. 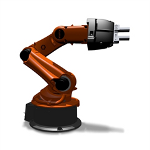 Baxter is different than other industrial robots by being less precise and rapid, but at the same time more adaptive and safe. We’re excited to use this industrial robot for research. 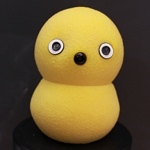 Keepon is a small, creature-like robot designed by Beatbots LLC. Keepon is used as both an interaction stimulus and a platform for embodied artifical intelligence projects. MAKI is a 3D printed expressive robot designed by Hello-Robo that can look around, blink its eyes, and move its head. MAKI can be replicated using a desktop 3D printer and off-the-shelf hobby electronics and in our case, modified for advanced HRI research. Paired alongside a virtual human, MAKI will be used to facilitate responses and activities through socially contingent interactions. 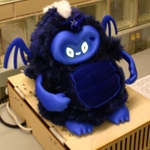 DragonBot is a social robot developed by Cynthia Breazeal’s Personal Robots Group at the MIT Media Lab. DragonBot represents a platform for long-term human robot interaction, with a cloud-based framework that attempts to personalize the experience for an individual user while maintaining the ability to learn novel concepts from other DragonBots. Nao is a two foot tall humanoid robot with 25 degrees of freedom designed by Aldebaran Robotics. 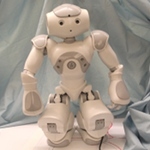 We primarily use Nao for human-robot interaction experiments. It is equipped with a speech synthesizer and is capable of performing complex motions such as sitting down, standing up from a prone position, and balancing on one foot. The YouBot arm is a 5-DOF robotic arm with a 2-DOF gripper attachment. Two YouBot arms are being used as a testbed for the Social Hierarchical Learning collaborative workbench environment. 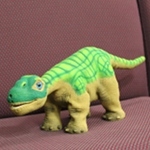 Pleo is an animatronic dinosaur robot designed by Ugobe. 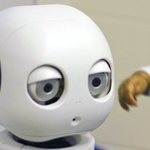 We use Pleo in our studies of human-robot interaction, especially those involving children with social deficits. 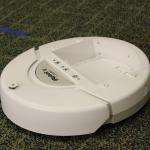 The iRobot Create is a simple platform that we use for psychophysics experiments. Its simple visual appearance and modularity make it an ideal candidate for motion-dependent experiments. 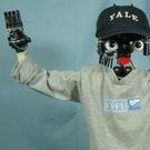 Nico is an upper-torso humanoid robot, designed to match the body structure of the average 1-year-old male child. This platform serves as both an interaction stimulus and as a testbed platform for our models of social development.